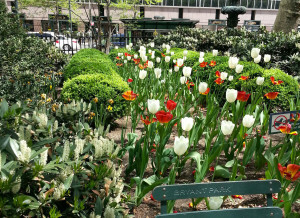 After several days of rain, the weather in New York City last Wednesday morning was absolutely gorgeous with sunshine, bold blue skies, a gentle breeze, and brilliantly colored flowers… everywhere! 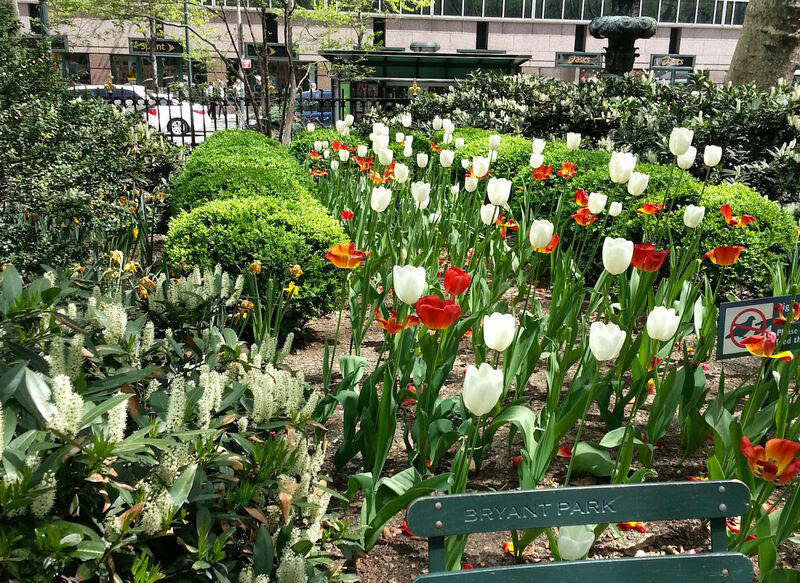 I had heard that tulips were in bloom all over the city and saw some for myself on my cab ride into the city earlier in the week. But the previously mentioned rainy weather and super busy convention work kept me from exploring sooner. Finally, I had all morning on Wednesday to wander around before catching my flight back home in the evening. And I wasn’t about to waste any more time indoors. 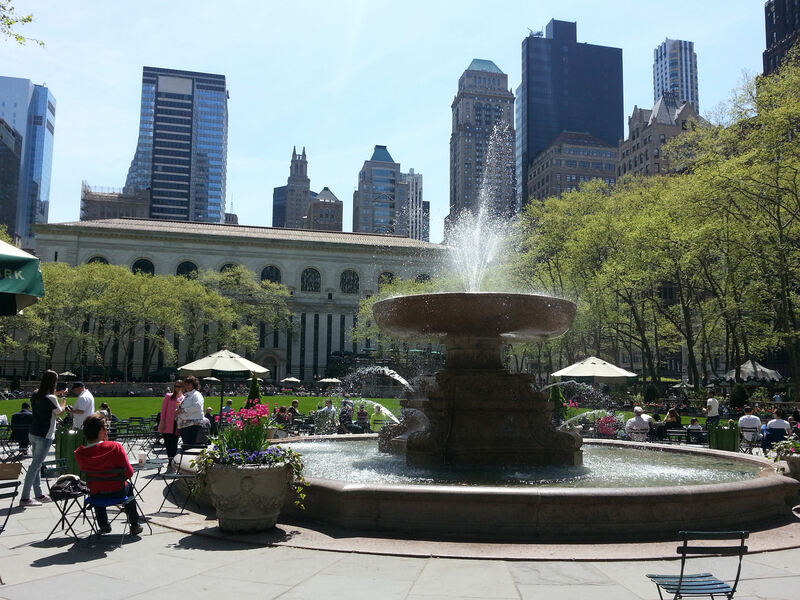 So after a walk around the Garment District, which was near my hotel, I strolled over to Bryant Park. I have long loved this pretty little green area in the middle of a sea of skyscrapers, but I had never seen it all dressed up like this. 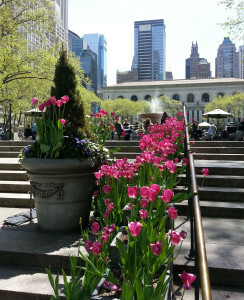 The colorful, beautifully planted flowers were everywhere, including along the west side steps near the fountain. 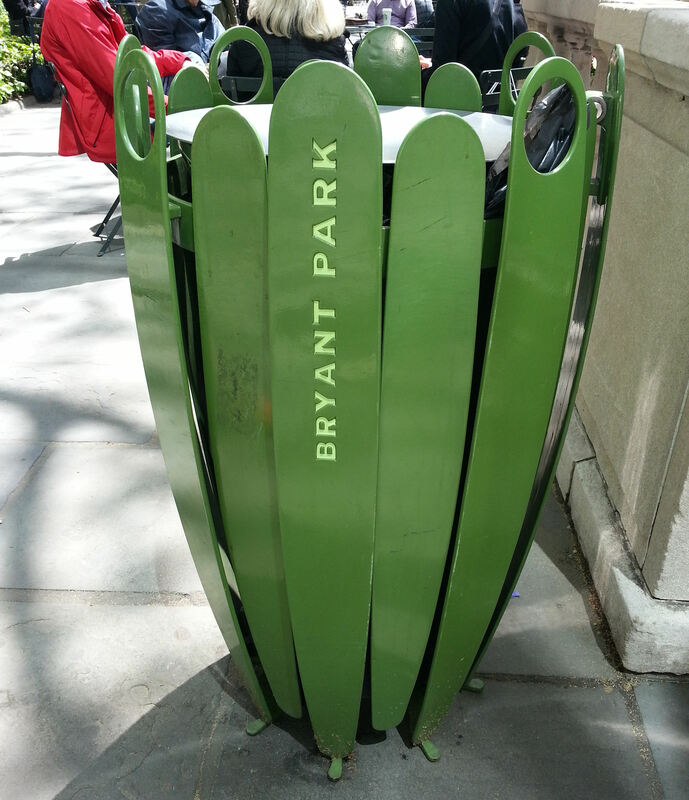 Even the flower-shaped trash cans made me smile. There was an event scheduled for later in the day, so the football-field-sized middle green section (known as “The Lawn”) was cordoned off. But there were still a LOT of people wandering around or relaxing. Although the area was designated as a public property in 1686, and later became known as Reservoir Park, it was officially renamed Bryant Park in 1884 after long-time editor of the New York Evening Post, William Cullen Bryant. In 1974, it was designated as a Scenic Landmark and it was completely renovated by 1992. Today, the 9.6 acre park is a super popular lunch spot during the week and a gathering spot on the weekends. It offers casual events such as juggling and fencing demonstrations, movies under the stars, and Piano in the Park and Shakespeare in the Park performances, as well as big-name concerts from stars such as Miley Cyrus and the Black Eyed Peas. However, I prefer its calm and laid back days. Heck, it even has an outdoor Reading Room with chairs, tables, and carts of magazines and books all located in a shady nook! Or if you prefer to go online, the park is also a Wifi Hot Spot. 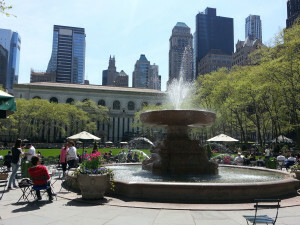 Yep, any time is great for a leisurely stroll through Bryant Park, listening to people talking and laughing, the fountain bubbling, and usually a musician or two quietly playing for tips. But it is especially wonderful when its flowers are in full bloom and putting on a show. So if you’re in the area, go! Go now! It’s free, it’s beautiful, it’s interesting, and it’s a great spot for a break. What are you waiting for?? 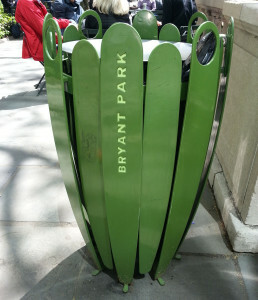 NOTE: Bryant Park is located directly behind the New York Public Library and is between 40th and 42nd Streets and Fifth and Sixth Avenues. Click on any picture (all of which were taken with my phone!) to see a bigger view. Beautiful pictures. Thank you for showing us these wonderful pictures of all the fabulous flowers in their glory. 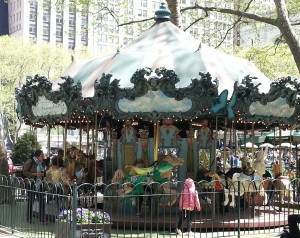 It shows that that not all things have to cost a lot of money to enjoy. Just remember to stop and enjoy the beauty. It really was gorgeous! And that’s a great point. Everyone knows that Manhattan can be VERY expensive, but there are also lots of cheap (and even free!) things to do. I really enjoyed the flowers! Thank you for sharing. You’re welcome! I’m really missing them now that I’m back home with all of our rainy/stormy weather. Once again, you have transported me. I feel as though I am there enjoying the spring explosion of flowers…and the winter-people. I’m so glad you enjoyed my post Sandy! Spring is my favorite season and tulips are just about my favorite flowers. So it was a great match. 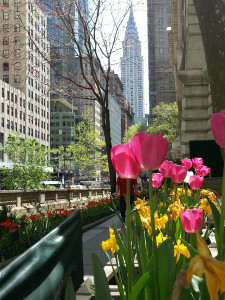 The flowers and green grass are so beautiful to see among the concrete and buildings. Thanks for showing us a different side of NYC. You’re welcome Jana! I love NYC’s buildings but it’s such a nice break to see a beautiful patch of green. And then you add in the extra special flower show and it truly brings a happy, calming effect. Thanks for commenting! And I love your pictures in your link re: a lunch in Bryant Park. They made me very hungry! So nice to see a side of New York City I haven’t heard a lot about. It’s like a calm place in the middle of a storm. Wow, what a beautiful place to be. Seeing all your beautiful pictures of of gorgeous flowers has made me smile too. Very nice article. 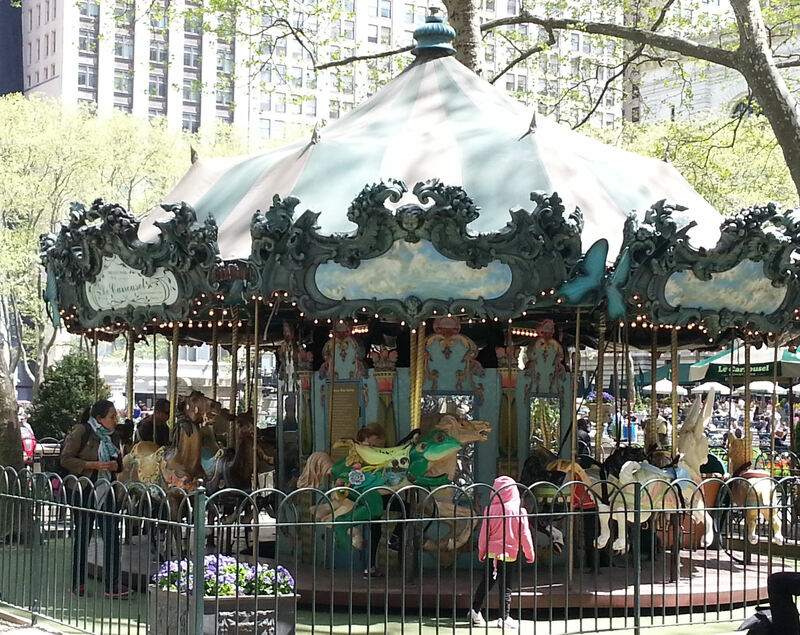 @Jimmie: I like your description of the park as “a calm place in the middle of the storm” and chaos that is NYC. @Darlene: Glad the photos made you smile. They’ve made me very excited about Spring. 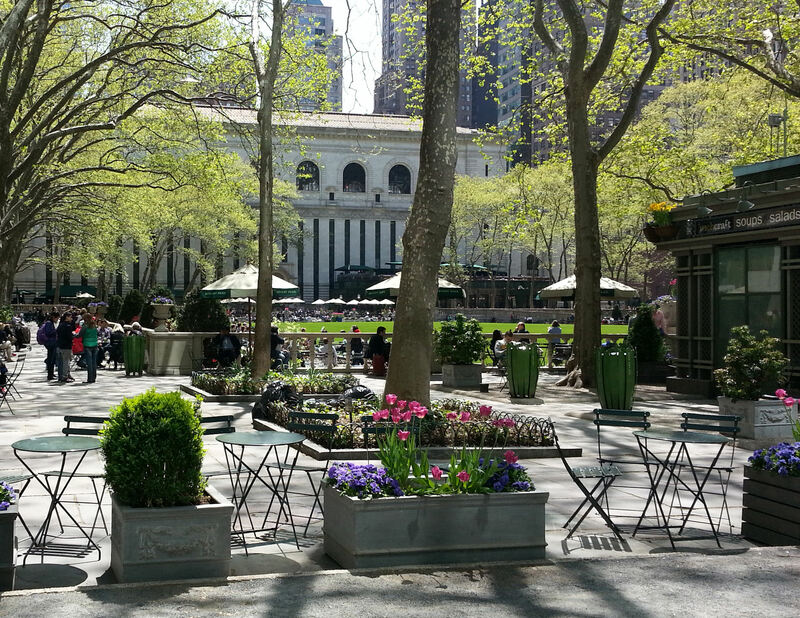 What a nice bunch of great pictures of Bryant Park. I can’t believe that you took those with your smart phone. Looks like a calm place to be. I remember New York with tall buildings, cars, taxis and lots of concrete. Good job. I was a bit surprised that the phone took such great pics too, Hayes. But the flower show was so overwhelming, I guess nothing could mess up their beauty! Oh, this is so gorgeous. 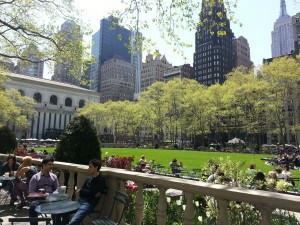 I love Bryant Park; it’s been too long since we’ve been in NYC. 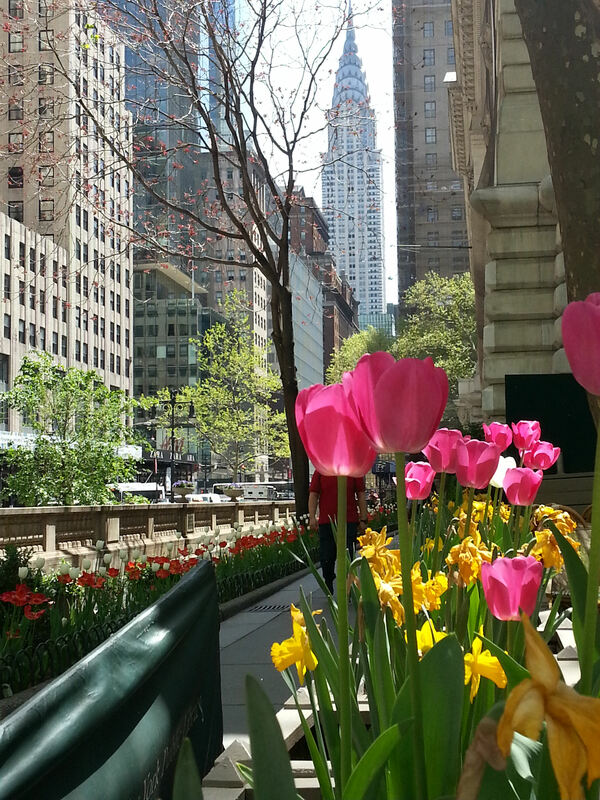 Spring in the city was always my favorite with everything budding and blooming. Love! Thanks so much for sharing on Inspire Me Wednesday. Featuring you in this week’s issue. Oh my, thanks so much! I loved sharing about such a blooming great place. Great website. Found you through Mama Buzz website. Will return to read more. Thank you for the kind words Christine! And glad to welcome another “Mama Buzz-er” to my site. Might I recommend, for any flower lovers visiting NYC, a free experience in Manhattan – the High Line. Highly (no pun intended) recommended! Great suggestion Alana! I LOVE the High Line and was disappointed I didn’t get a chance to go over there on this visit. Next time for sure! Deborah, thanks for stopping by my blog! I think I’ve only been to Bryant Park once. Since we were next to Central Park I never bother to go down there. 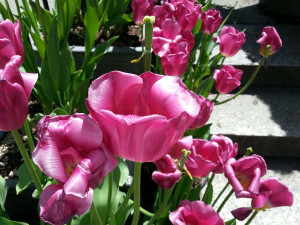 I wish I could do it all over again, I would certainly love to see those tulips. Thanks for sharing! And thank you for stopping by here Eva! 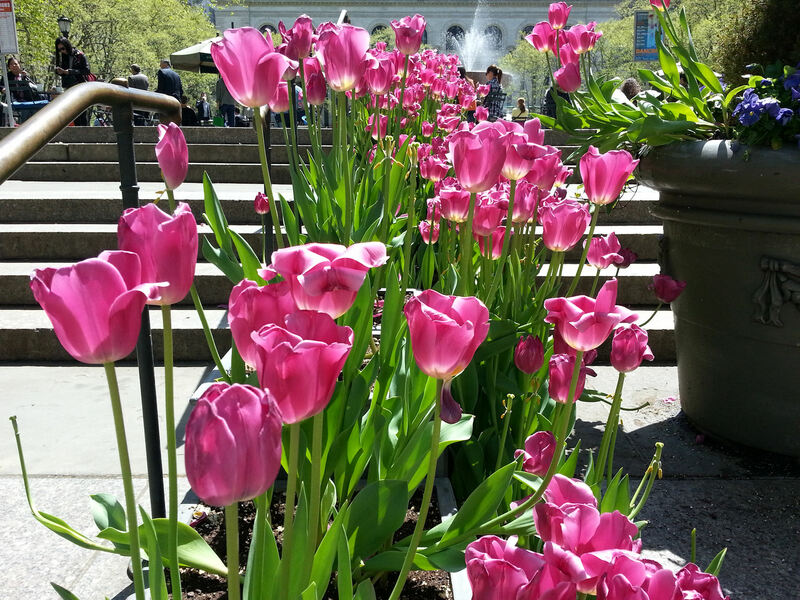 Maybe your next trip back could coincide with tulip season? As you know, that’s the thing about NYC – there’s just so much to see and do there’s no way to cover all the cool things!